From reading the outline of the twelve-part epic story The Daleks' Master Plan (which has the record for the longest story in Doctor Who*), it looked like a strong story. However, due to the lack of foresight of the higher-ups, the story is alas, incomplete. It has in fairness fared better than the three preceding stories (Galaxy Four, Mission to the Unknown, and The Massacre of St. Bartholomew's Eve) in that we have any complete episodes at all. As of this writing, a quarter of the story remains: Episode Two (Day of Armageddon), Episode Five (Counter Plot), and Episode Ten (Escape Switch). It is rather difficult to give an overall review of The Daleks' Master Plan without actually having The Daleks' Master Plan to review. However, since three episodes survive, I've opted to review those episodes and give an overall ranking to what remains of Story 021. It's not a happy solution, but the best one can do under less-than-ideal circumstances. We need a bit of background. The lost story Mission to the Unknown is a prequel to The Daleks' Master Plan. The Daleks have decided they will conquer the universe (no surprise there). The plot is discovered but those who know have been silenced before they can reveal all. In the interim, The Doctor (William Hartnell) has lost his Companion Vicki (Maureen O'Sullivan), who has decided to stay on in Troy and take the name Cressida. In her place, Katarina (Adrienne Hill), a handmaiden to the prophetess Cassandra, has boarded the TARDIS, in awe of the Doctor and Steven (Peter Purves). With that, you should be up to speed. Episode 2 (Day of Armageddon) has the Guardian of the Solar System Mavic Chen (Kevin Stoney) plotting with the Daleks to conquer all the galaxies. Of course, both Chen and the Daleks are using each other and planning to betray the other at the first opportunity. The Doctor, Steven, and Katarina join with Bret Vyon (Nicholas Courtney) to defeat the unholy alliance of Dalek and Chen. The main task through all of The Daleks' Master Plan is to keep the rare mineral taranium away from them. This material will aid them taking over and destroying the universe (perhaps all time itself). By the time we get to Episode Five (Counter Plot) poor Katarina has died: she opened the air-lock while held captive by a prisoner on Desperus, a planet they had crashed to while escaping with the taranium, and was swept out into space. Vyon has also died, killed by Sara Kingdom (Jean Marsh), a loyal soldier in Chen's service. A transport experiment now has swept the Doctor, Steven, and Sara to another planet, Mira, with the Daleks in mad pursuit. On this planet, the native Visians are invisible but dangerous. The Daleks, however, have tracked the trio down and the Doctor chillingly announces that "The Daleks have won". Now, by Episode Ten (Escape Switch), we see the Daleks have not won. The trio has managed to escape and now are in Egypt of the pharaohs. In the midst of the chases, a new figure has entered the mad race: the Meddling Monk from The Time Meddler (this time he is billed as the Meddling Monk instead of just The Monk, so we can refer to him as The Meddling Monk). He wants his revenge, but instead has gotten mixed up in the whole affair and is taken prisoner with Steven and Sara. The Doctor has no choice but to give the real taranium core in exchange for all of them. They manage to escape (thanks in part to local Egyptians who attack the Daleks--go Lotus Revolution! ), leaving the Meddling Monk stranded on an ice planet, but the trio are engulfed by a massive explosion. The final two episodes (the now-lost The Abandoned Planet and The Destruction of Time) wrap up the story. In short: the Daleks are defeated but at the cost of Sara Kingdom's life (in a rather gruesome end, she ages to the point of disintegration). With that, the Doctor and Steven are off to face another adventure. After watching the surviving episodes of The Daleks' Master Plan, it's a credit to Terry Nation and Dennis Spooner (who wrote the scripts for this massive twelve-part story) and especially director Douglas Camfield that they don't appear as disjointed as they could have. It helps when you have one object (in this case, the taranium core) be at the center of the story. Each of the surviving episodes has a strong and steady pace and packs a lot of information, action, and even comedy to it (the bumbling scientists in Episode 5 being the prime example). One of the best things about the surviving episodes of The Daleks' Master Plan is just how well-acted they are. Stoney clearly delights in his malevolence as Mavic Chen (although the fact that a character with a vaguely Asian background is played by a European might be troublesome now, I see the character as having no real ethnicity because by this time in the Earth's future, one imagines ethnicity is rather a moot point, but I digress). Throughout the episodes, he never shifts from being both evil and charismatic, a perfect villain to match the Daleks. Peter Buttersworth is a delight to have back as the comic yet dangerous Meddling Monk, who is both delightfully evil and duplicitous (with the only caveat being that one wonders if he got thrown in just to be thrown in). Courtney's Vyon is a tough soldier, a man who doesn't shrink from seeing Katarina killed because he sees the importance of sacrificing one life so that the rest can live. This applies to himself, he too in the end sacrifices himself for the others. Of the performances in The Daleks' Master Plan, the best is Marsh's Sara Kingdom. In the first episode we see her in (Episode 5), she is a no-nonsense soldier. By the time we see the last of her (Episode 10), she is a full partner in helping the Doctor (though Marsh insists Sara Kingdom was NOT a Companion, I believe she was, but that debate is for another time). The humanity behind the toughness of Sara came through, and the fact that she was in only ONE story but still leaves an emotional impact is testament to both Marsh as an actress and Kingdom as a character. There are within the three episodes a few flaws. I am not fond of invisible monsters (it screams 'cheap' and 'unbelievable'), and the wigs of the Egyptians in Episode 10 were comical (looking like they had wandered from a Beatles look-alike contest). As a whole, twelve episodes was probably far too long (and having read the synopsis of Episode Seven: The Feast of Steven, at least one episode was totally irrelevant to the story). Even with the missing episodes, The Daleks' Master Plan is still a remarkably strong story that is worth restoring, with great performances by Courtney, Stoney, and especially Jean Marsh. The Master Plan may have failed, but we treasure what remains. Now for some housekeeping. Story 022: The Massacre of St. Bartholomew's Eve (or just The Massacre) has no known surviving episodes, clips, or even off-air recordings. However, it is important because the next Companion, Dodo Chaplet (Jackie Lane), makes her debut in the story, and she will make her first full-story appearance in the next surviving story, Story 023: The Ark. * Here we have a curious issue among Whovians. There is debate as to whether or not the season-long Trial of A Time Lord counts as ONE story or as FOUR. Those who count it as 1 story will point out that at fourteen episodes it's longer than The Daleks' Master Plan. Those who count it as 4 will argue that it can't possible be the longest. Now, an argument can be made both ways. The pro-Trial group states that the story had ONE title with Episodes 1-14. The anti-Trial group will point out that The Daleks' Master Plan had TWELVE titles but is really ONE story. In this debate, I fall squarely on the anti-Trial side. With Doctor Who, titles border on the irrelevant because there has never been any consistency. 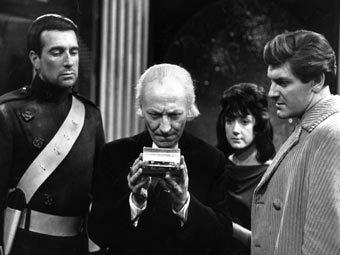 In the First Doctor's era, each episode had an individual title but was tied into one particular story until the now-lost story The Savages, which began the tradition of having each story carry an overall title and each episode being Part One, Part Two, etc. The revived series has gone BACK (to my mind bizarrely) to the First Doctor's title methods: the three episodes Utopia, The Sound of Drums, and Last of the Time Lords make up ONE story but (Russell T Davies notwithstanding), I never hear people argue they are THREE stories. (Side note: MY overarching title for these three episodes is Vengeance of The Master, since one of most iconic villains has never had the privilege of having his name on a title. The Daleks have, the Cybermen have, the Sontarans have, even the Rani has, but the poor Master has never had any story called Blank of The Master or The Master's Blank...until now). That being said, I believe The Daleks' Master Plan still remains the longest Doctor Who story filmed, but since it is incomplete, the longest complete Doctor Who story is at the moment the ten-episode Second Doctor story The War Games.